The Studio is a 90 sq. m. apartment on the ground floor of our barn development. 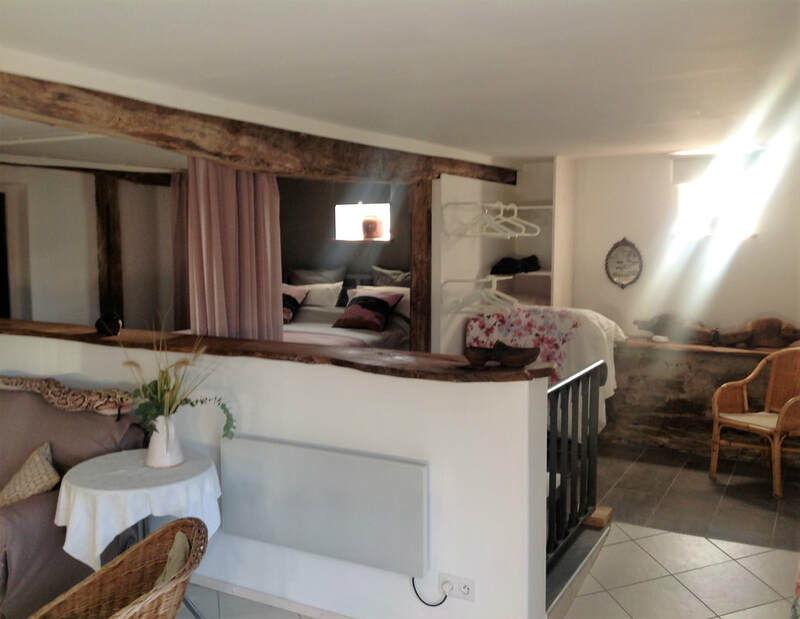 It is designed to work as a gîte or chambres d'hotesl so is very flexible. We have developed the space to have good accessibility for people with reduced mobility, including wheelchair use (a description is given below). 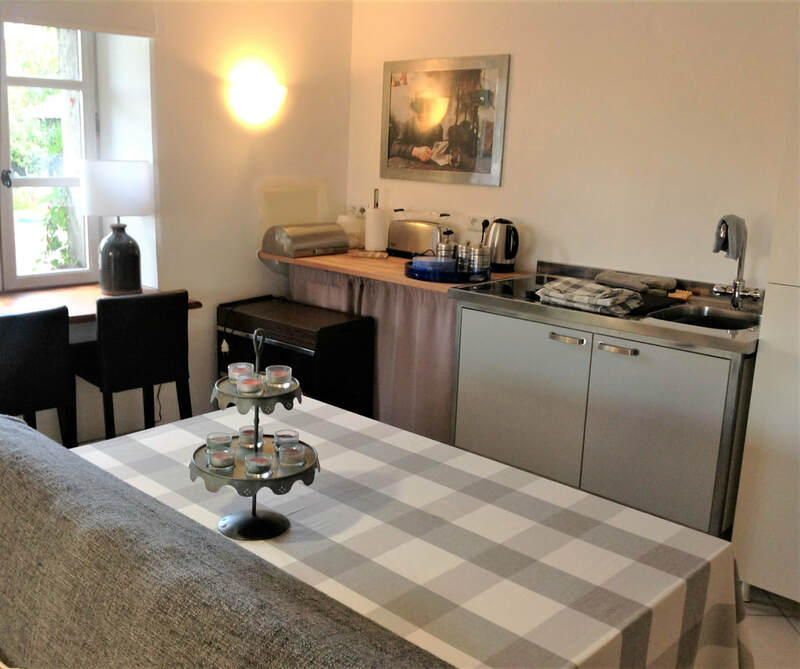 It provides very comfortable, spacious accommodation for a couple, with room and facilities for a baby, plus one or possibly two children. The Studio has a large living room and a corner kitchen with hob and infrared microwave, fridge and sink. The living room leads to a dressing room and a bedroom with a king-size double bed. There is space for a single folding bed, and there is also a futon bed. Adjoining the bedroom is a large bathroom with Italian shower, two sinks and WC. The studio has its own patio, with table, chairs and barbecue and direct access to all the facilities in the garden - swimming pool, boules court, and children's play areas. 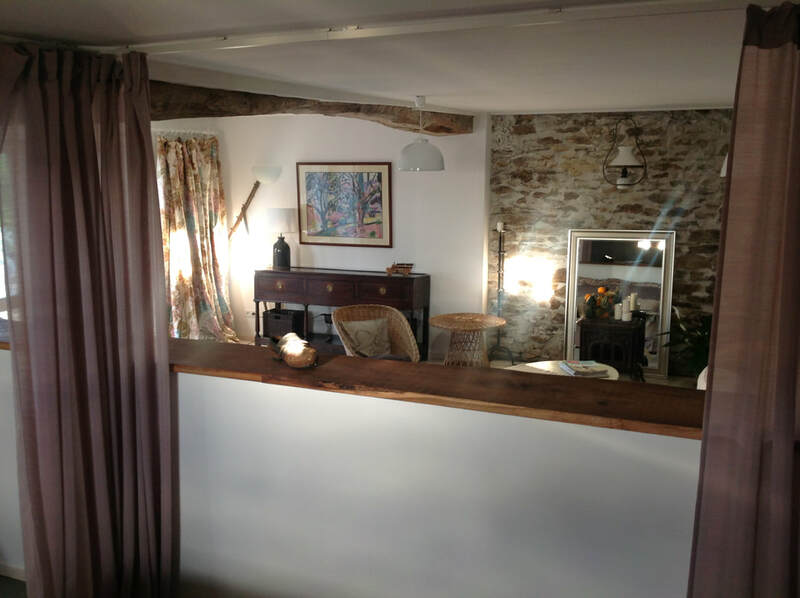 As the Studio is adjacent to our Guest Dining Room and Summer Dining Area we can offer it as a gîte, for guests to self-cater but being able to book breakfasts and/or evening meal on an occasional basis; or we offer the Studio on a chambres d'hotes basis, with breakfasts included and evening meals when required. 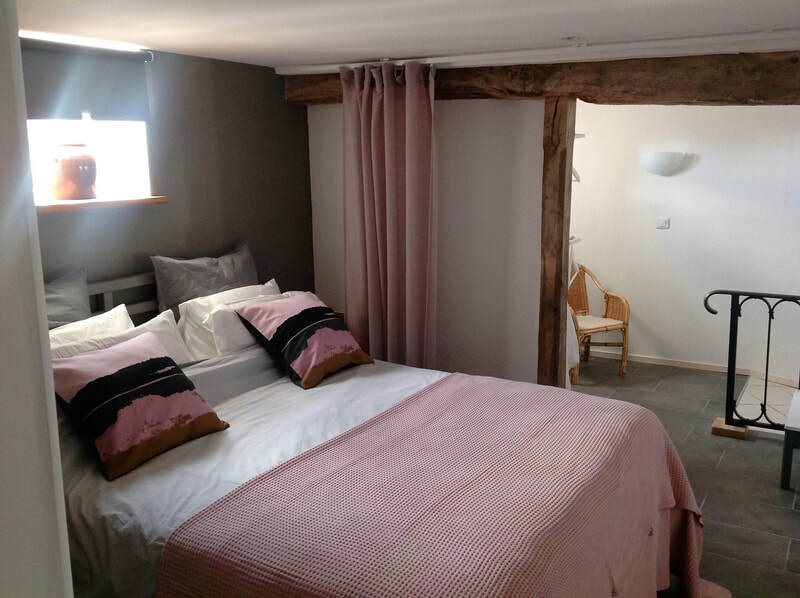 For details of rates for the Studio as gîte / chambres please see Rates on the website menu. For guests booking the Garden Studio on a gîte basis, we provide a 'welcome pack' of food basics, enough for breakfast and drinks during your first day or two - and to save having to make catering arrangements your first evening and morning, you are most welcome, as we say above, to book an evening meal and/or breakfast. Access to the Studio from the parking area is flat and suitable for wheelchairs if required. The French doors leading into the living room are two metres wide, and all other doorways/entrances are a minimum of one metre wide and all 'walkways' around the Studio are wide enough for wheelchair mobility and there are no steps, only a gentle slope leading up, with a handrail, to the bedroom/bathroom areas. 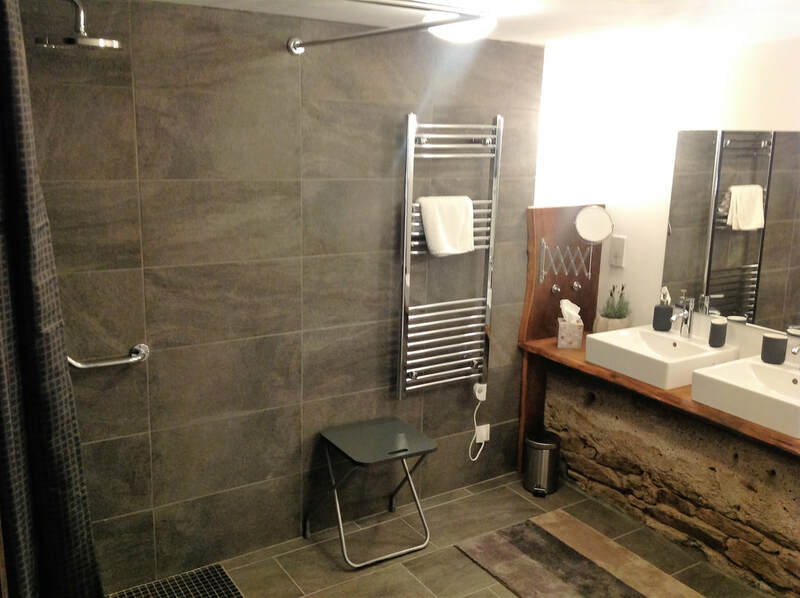 The bathroom provides an 'Italian shower', with no shower tray lips or raised edges; the twin sinks are designed to enable access from wheelchair seating, and the shower and WC have approved accessibility seating available. Electrical plugs and switches are placed for maximum accessibility and lighting around the rooms is 'sequenced' to provide ease of use. 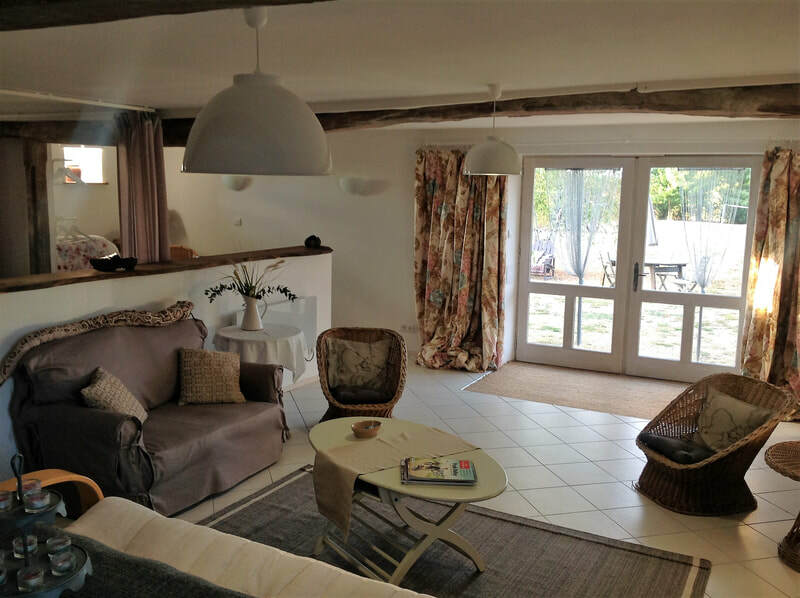 Access to the adjoining Chambres' guests sitting/dining area (if breakfasts/evening meals are required) is through wide, double French doors and there are no steps in that area. Access around the garden is generally flat, with extra-wide pathways around the summer dining and barbecue area and the pool. There are some low steps, but ramps can be provided if required. We will always arrange facilities as far as possible to enhance our current levels of accessibility and can talk this through as part of the booking process - please just ask!